The Magnificent Ambersons (1942) is one of the 1001 classic movies you should see. This Orson-Welles directed drama about a turn-of-the-century Indiana family stars from left: Richard Bennett; Joseph Cotten; Dolores Costello; Don Dillaway; Agnes Moorehead, and Ray Collins. Each Monday Friday, I'm going to recommend a classic movie you should see (for the reasons behind the 1001 series and reviews of earlier films covered go here). This month I'm writing about the leading ladies of 1942. 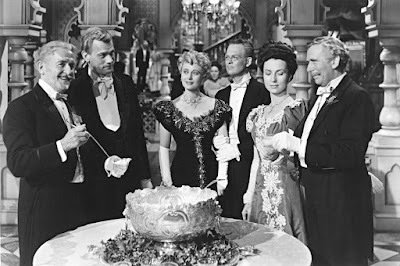 This week's movie is the drama, The Magnificent Ambersons, which stars Dolores Costello and Agnes Moorehead as two members of a large Indiana family. The Magnificent Ambersons follows the fate of the beautiful Isabel Amberson (Costello) and her beloved son, George (Tim Holt), who live in turn-of-the-century Indianapolis. As a young woman, Isabel was in love with inventor Eugene Morgan (Joseph Cotten), but she eventually rejects him in favor of a more socially acceptable match to the dull Wilbur Minafer (Don Dillaway). After Wilbur unexpectedly dies, Eugene and Isabel reignite their romance despite the glowering disapproval of George and the agitated hysterics of Wilbur's sister, Fanny (Moorehead), who secretly carries a torch for Eugene. 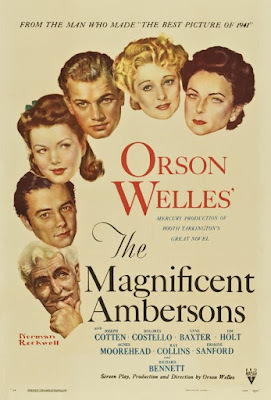 The Magnificent Ambersons is based on a series of Pulitzer Prize-winning novels by Booth Tarkington that writer and director Orson Welles had already turned into a radio play for his Mercury Theatre on the Air. Welles decided to follow up his groundbreaking first feature Citizen Kane (1941) with a film version of Ambersons that featured many of Welles Mercury players and incorporated the deep focus cinematography and complicated narrative structure that had made Kane so memorable. The result was a roughly 135-minute film that, after two disastrous preview screenings, was taken out of Welles' control by RKO Pictures. The studio then edited and reshot the film into a severely truncated 88-minute version that nevertheless earned critical praise and four Academy Award nominations. Despite the studio's extensive cuts, The Magnificent Ambersons still features landmark performances from silent star Costello and Mercury Theatre alum Moorehead with the latter actor receiving a much-deserved Oscar nomination for best supporting actress. In fact, Welles, who often described Moorehead as "the greatest actress in the world," showcases her throughout the film, and her performance as the frequently hysterical Fanny is one of the landmark screen performances of the 1940s (keep your eye out for the famous boiler-room scene). Costello, a silent star who is probably best-known today as the grandmother of Drew Barrymore, is also excellent as an emotionally fragile woman who cannot contend with her family's grasping ways. 1. The ending. Welles' original ending was downbeat and ambiguous. However, once the movie was out of Welles' control, the studio brought back Cotten and Moorehead to shoot a bizarrely cheerful final scene that undercuts the previously melancholy tone of the movie. 2. Welles' background. The director came from a socially prominent Wisconsin family that was somewhat similar to the Ambersons. There are similarities to his own childhood throughout the film, especially his close relationship to his mother and his father's love of tinkering with machines. 4. Stanley Cortez. The great cinematographer does impeccable work here, especially in the famous party scene where the camera roves among the assembled guests. This was severely cut by RKO -- Welles said the original scene was the greatest technical achievement in film-- but it's still impressive nonetheless. 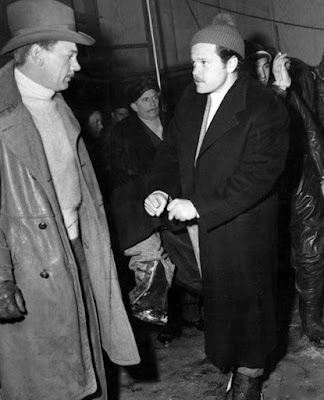 Joseph Cotten and Orson Welles on the set of The Magnificent Ambersons (1942). 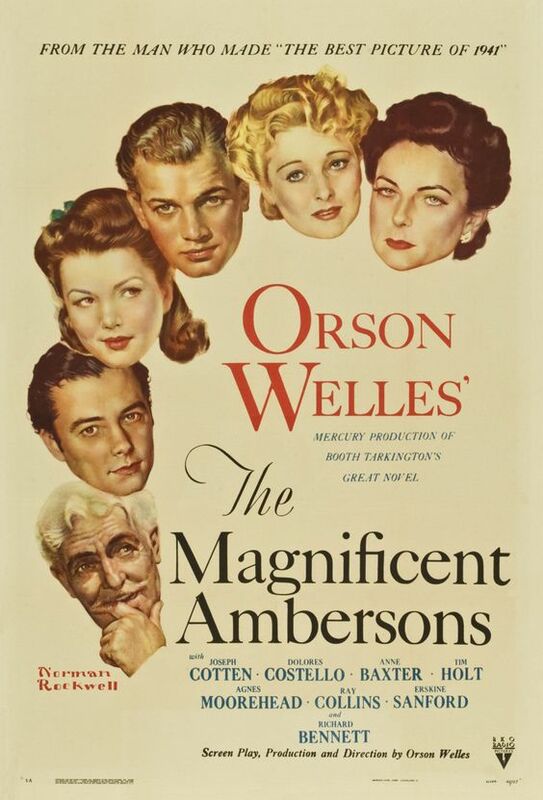 Other critics: The Magnificent Ambersons has a 91 percent fresh rating at Rotten Tomatoes and Leonard Maltin writes that "Welles follow-up to Citizen Kane is equally exciting in its own way" in a 4-star review in his Classic Movie Guide. Critics in 1942 were mixed about the movie's merits. The Time magazine critic didn't think the movie was as good as Citizen Kane, but he added, "it is still good enough to remove Director Welles from the one-picture prodigy class." The Variety critic hated it, especially the central character of George. "Orson Welles devotes 9,000 feet of film to a spoiled brat who grows up as a spoiled, spiteful young man. This film hasn't a single moment of contrast; it piles on and on a tale of woe, but without once striking at least a true chord of sentimentality." The bottom line: It's true that The Magnificent Ambersons doesn't quite reach Kane's dizzying heights, but it is still a major accomplishment from one of old Hollywood's most important filmmakers. Watch it for the beautiful cinematography and Moorehead's great performance. 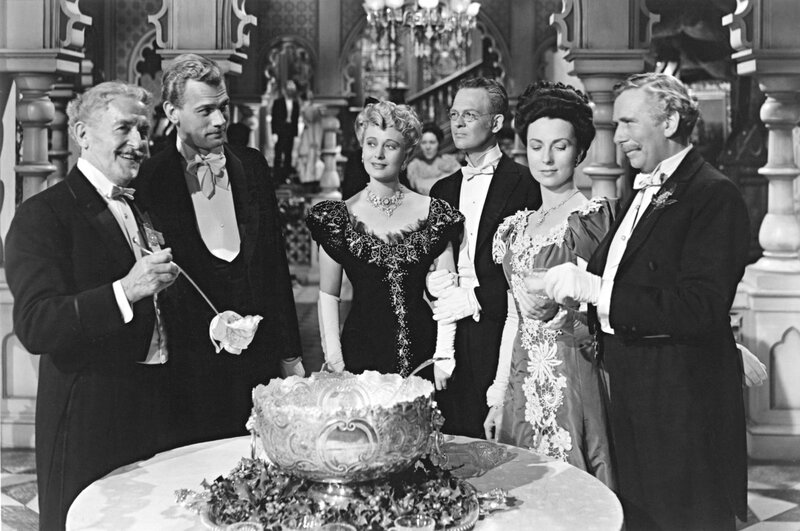 Availability: The Magnificent Ambersons is available on DVD, Blu-ray, and video on demand. Next Friday I'll begin the June theme of World War I movies with All Quiet on the Western Front (1930).